The Shun series of chef‘s knives is one of the most comprehensive damask steel series worldwide and highly appreciated by top class professionals as well as ambitious hobby chefs. Shun professional chef’s knives, with one cutting edge, are made from specific stainless damask steel with 32 layers on each side (64 total). The core layer is made from VG MAX steel. This is an extremely hard (61±1 HRC, 1.0% carbon, 1.5% cobalt) and corrosion-resistant steel that gives the blade a sharpness that is second to none. The convex cut of the blade together with the manual honing of each Shun knife delivers an unrivalled sharpness that allows the knife to cut through even the toughest material. This sharpness together with the well-balanced weight of the knife makes for tireless work. Each Shun knife gets its unique and individual character by refining the natural beauty of the damask grain. This way every Shun knife is unmistakable and unique – a piece of art, united by craftsmanship, technology and design. Inspired by the masterful art of Samurai swords the technique for manufacturing the finest chef’s knives enables the Shun series even to deliver knives with western blade shapes. The slim handle made of durable pakkawood is fashioned in a traditional Japanese chestnut shape. High quality resins added to the wood make the material particularly robust and resistant to moisture. Its typical chestnut shape ensures a comfortable and secure grip when cutting, thanks to a slight angle on the right-hand side. The Shun Classic Paring Knife is a must-have for every kitchen. In a way, you can think of it as the.. 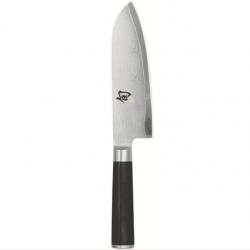 In size, the Shun Classic Utility Knife with left handle is between a chef’s knife and a paring knif.. This is also a multi purpose knife, but with a slight vegetable bias. Santoku means 'Three Virtues' ..
MULTI-PURPOSE—AND VERY HANDYThis is also a multi purpose knife, but with a slight vegetable bias. Sa.. ASPIRE TO THE PERFECT SLICEAchieve the perfect slice of meat or poultry with the Shun Classic Carvin.. YOUR BREAD DESERVES THIS KNIFE After a chef’s knife and a paring knife, some cooks say that the.. YOUR NEW BEST FRIEND IN THE KITCHENIf there is one knife that you simply can’t be without, it’s this..
OUR LONGEST CHEF'S KNIFESome cooks simply prefer a longer chef’s knife. For them, we offer the Shun .. THE PERFECT MATCH FOR THE SHUN CLASSIC CARVING KNIFEThe Shun Classic Carving Fork is an elegant matc..
MULTI-PURPOSE—AND VERY HANDYThe Shun Classic Steak Bonding Knife is part of the Shun Classic line .. IF YOU LOVE STEAK, YOU'LL LOVE A SHUN CLASSIC STEAK KNIFEYou’ve grilled the perfect steaks, but how .. TRY A SHUN VEGETABLE CLEAVER FOR AN AMAZINGLY VERSATILE CUTTING EXPERIENCEThe Shun Classic Vegetable..